The ten day new high to new highs and new lows ratio (NH/NH+HL) is once again at historic highs (99-100%) this week. Below is my observation of this indicator and why it is a bullish omen. Before I present the results, I would like to make the following comments concerning “New Highs and New Low” studies. It has long been my observation that they have some statistical significance, but they have 3 characteristics that should be acknowledged by users. The ratio is bounded by zero and one. Therefore a day that has 10 new highs and zero new lows such as March 26, 2009 will give you a very similar one day statistic (100%) to January 11, 2010, when there were 522 New Highs and 2 New Lows, (99.6%). Although the ratios are the same, these are obviously different type days. Many look at the % of issues making new highs or new lows as a function of the number of issues traded to avoid this. A 10 day reading of 99% will not have the same characteristics at the end of a bull market as it does at the beginning of bull market. The statistics that you get from New Highs and New Lows are driven primarily by the strength of the internals of the market over the last 12 months, but secondly, the range of the prior trading range is going to be a major factor as well. If the trailing NYSE has traded in a 20% trading range over the last 12 months, you are going to get much different results than if it traded in a 40% range. This is why the number of stocks trading above or below its N Day moving average are used by many analyst to give a similar measurement of internal participation. It is probably not wise to take such studies back beyond 1974, as before that time, new highs and lows were always recorded in reference to the beginning of the year. Most analyst seem to ignore this. I had data in my file back to 1970 and used it as well for this study with this characteristic disclosed. The data table below shows all the times since 1970 that the ten day NH/(NH+HL) ratio is greater than 99%, the S&P close on that day, and the 252 day (approximately 1 trading year) change in the S&P. 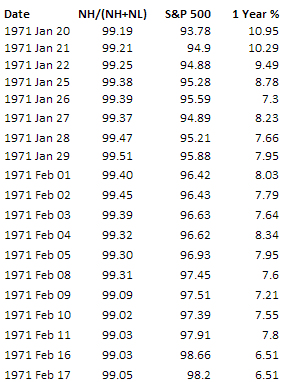 The only period in which the market was not higher 12 months later was the 1977 Jan 05 - 1977 Jan 10 period. I have a bearish Omen! Accumulation - Distribution Index shows stocks are under distribution for the last few months even though price keeps going higher. This is similar to 2007 top! Once the crash starts, it will be one that goes into history books.